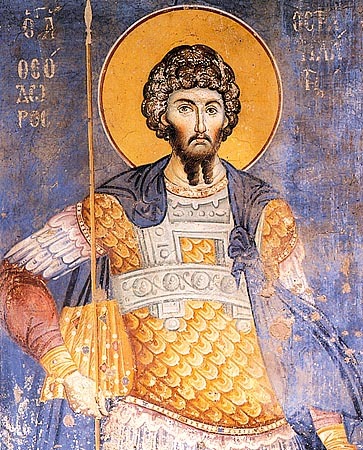 About four miles from Damascus, there is a village called Karsatas, in which village there is a church dedicated to Saint Theodore. Saracens came into this church, and lived there, causing every kind of filth and uncleanness from women and children and animals. One day many of them were sitting together and one of them shot an arrow at the icon of Saint Theodore and hit it on his right shoulder, and immediately there came out blood, which flowed to the bottom of the icon, while they all had looked at the sign that had taken place and the arrow sticking in the shoulder of the Saint and the blood flowing. And even though such a sign had taken place, those who saw it were not moved to a sense of sin. Neither did he who shot the arrow repent, nor were any of them troubled in themselves, nor did they leave the church, nor did they cease defiling it. Nevertheless vengeance came upon them. In a few days' time, of the twenty-four families that lived in the church, all of them were destroyed by a bitter death, no one else in the village itself dying save for those who were living in the church during those days. This icon that was shot at is still there with the wound of the arrow and the mark of the blood. Many are alive who have seen it and were there when the miracle happened. And I, too, have seen this icon, and having seen it, I have described what I have seen.